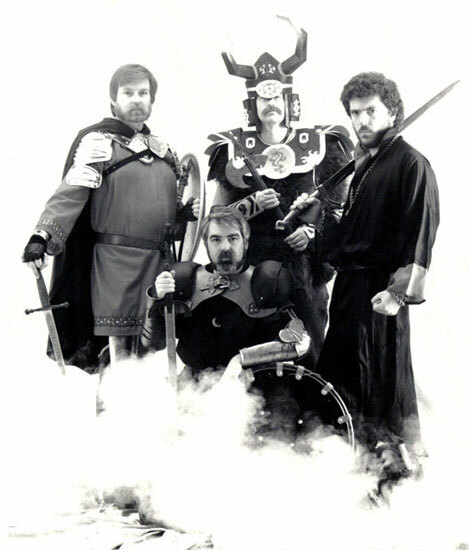 Clyde Caldwell, Jeff Easley, Keith Parkinson, Larry Elmore. These guys had more impact on my career as an artist, and interest in fantasy, than anyone else. I've since met each of them, except Clyde Caldwell. So sad that the youngest one of the bunch, Keith Parkinson, has past away. If I have any regrets in life it is not purchasing his painting of Dragons of Desolation when I had the chance. 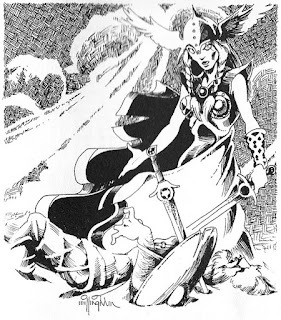 Larry Elmore paid me one of the greatest compliments in purchasing a print of one of my paintings at Gen Con and telling me how we new fantasy artists were taking our art to levels he never dreamed of. Jeff Easley awarded me the "Judges Choice Award" at another Gen Con. I'm humbled. When inventing fantasy cultures I like to draw inspiration by combining real world examples. In much the same way that many writers us people they know, or a melange of acquaintances in order to create unique, compelling, and believable characters. I use a similar technique by combining multiple real world cultures into a unique new culture. 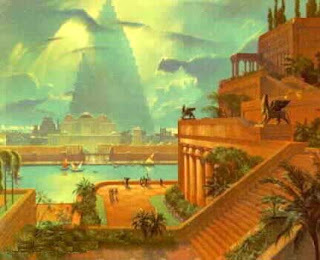 In my own Tarniss for example Gabrell is a combination of Norse and American Indian, while Dolmaranthuz the "great empire" of Tarniss is a combination of Rome and Arthurian Britain. This does not exclude injecting a liberal dose of pure fantasy and imagination into the equation. I use real world cultures as a stepping stone to make fantasy cultures have more depth. Unfortunately this table omits many great cultures, as there are so many it's likely impossible to summarize them all, so think of this as a sample. At first glance these seem too opposite to reconcile, one is free and semi-nomadic, the other builds epic cities. But I think we can find some synergy here. This once mighty empire has fallen into crumbling ruins. It is an ancient land filled with the skeletons of great cities whose builders have long since died out. It is a forlorn place of massive ziggaret ruins now occupied by the fierce Antoli tribes who immigrated from the cold northern lands after being pushed out by the barbarians of Loka Dranel. After wandering the plains surrounding Landrod, the Antoli tribes have made their homes in the ancient haunted cities long abandoned by its ancient builders. This has proven to be a formidable defensive position and the tribes have prospered in the fertile land. The chieftains of the Antoli, who once warred with one another, have formed a great council. They have realized that they must band together to form a strong union if their people are to survive. The council has chosen the great chieftain Brak Pokanta (which, transliterated, means Raven's Claw) as the head chieftain of all the tribes. Together they have formed a powerful nation that can defend itself against its enemies. The tribes worship many gods, but these gods are forces of nature like Grondal which means "stone" and Alowatta which means "water". There are no greater or lesser gods, they are all co-equals that maintain balance in the world. The Antoli have long been hunter, gatherers, but they are learning to farm and take advantage of city life, and have even opened up trade routes with their neighbors to the south Kcish and Keintol. The wise shamen have discovered the ancient libraries of Lanrod and are fascinated with the knowledge of astronomy and law they have uncovered. This is having a profound affect on the tribes, which have began teaching literacy, medicine, and science. For years I looked down on Oz as candy coated kiddy fare. But I recently read the original Wizard of Oz for the first time. If you've only seen the movie, then you haven't experienced this wonderful, magical place created by L. Frank Baum. The famous 1939 movie only covers a very edited version of the first half of the book. I found that once the Tin Man, Cowardly Lion, and Scarecrow got their heart, courage, and mind that the book really gets good! The rest of the book is spent in adventures showing what they did with their gifts. And it all struck me as being very much like a good D&D campaign with dark forests, powerful, terrifying and evil creatures, and of course the Wicked Witch of the West. 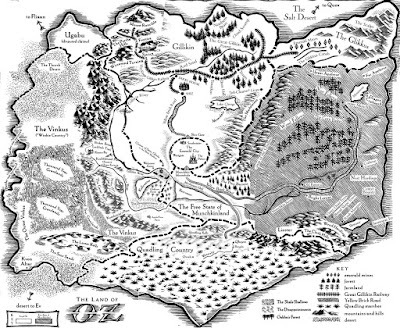 I could easily see Oz as a great fantasy world for an old-school campaign. It's got all the ingredients for epic fantasy adventures with villains, strange inhabitants, fantastic locations, magic, and deadly creatures. It is a much darker, scarier place than the colorful musical version would ever lead you to believe. 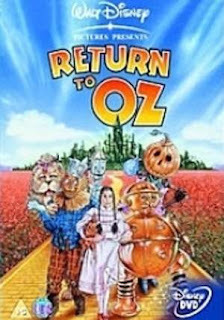 In my excitement for Oz I rented the 1985 movie Return to Oz, and enjoyed it more than the famous 1939 musical. Much more. 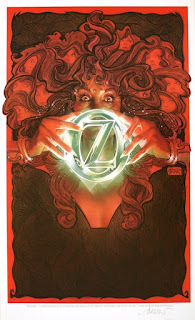 And Return to Oz is so much more faithful to L. Frank Baum's writing. Mombi: Not beautiful you understand, but you have a certain prettiness, different from my other heads. I believe I'll lock you in the tower for a few years until your head is ready. And then I'll take it. Dorothy: I believe you will NOT! I'm collecting the other Baum Oz books on my eReader (currently my iPhone, but quite possibly for the iPad when it comes out) and am looking forward to experiencing more of the wonderful world of Oz. This is great news! Michael Giacchino scored LOST and the last Star Trek film, as well as several Pixar titles. His work is epic and he has a real ear for creating the proper mood, ambiance, and feeling for the story. You can hear some of his work here. This tendency towards systematizing everything probably led to the success of the original Dungeons & Dragons. How else could the mad (genius) ravings of Dave Arneson be transformed into the masterpiece that was the original white box? But this tendency also lead to absurdities, some of which have since been purged from the game. I won't dwell on what those are. Instead I want to propose an idea I've had brewing for a while. 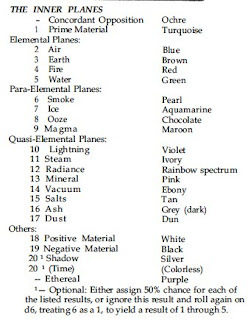 What if Gygax had developed his method of systematization to a finer degree at the time he wrote the original booklets, and what if he'd kept the focus on six character classes, one for each ability? Here is a systematization of 6 basic character classes, one to conform to each ability. To avoid all the thief or not nonsense so often talked about, I've replaced the thief with a class called the "scout". Not only is it less morally ambiguous, it allows for a bit more freedom in describing what the class can, and cannot, do. 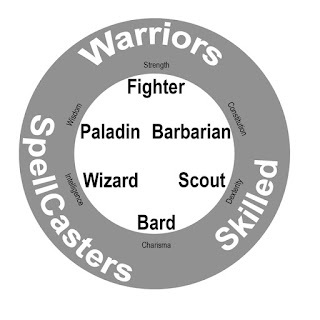 So the basic classes are: barbarian, bard, fighter, paladin, scout, and wizard. The "prime" classes: fighter (a pure warrior), wizard (a pure spell caster), and scout (pure skill based). The beauty of this is the way it synchronizes with each of the abilities, fills each of the roles in an adventuring group, and creates a seamless circle. Astute reader you've noticed the cleric is missing! I've always been bothered by the definition and role of the cleric. Also it's the class that any group when creating characters inevitably says "someone has to be a cleric" so they can have their traveling hospital. So, I've chosen to replace him (or her) with a more appropriate class: the paladin, clearly a warrior but with a divine mission and some spellcasting and healing powers. A much more reasonable candidate for adventurer than some priest best left to his studies in some dusty monastery. This is just a fun variant, or speculation on how a different type of systematization could be applied to the original d&d. The Fiend Folio is much maligned for its silly and inane plethora of implausible beasties. 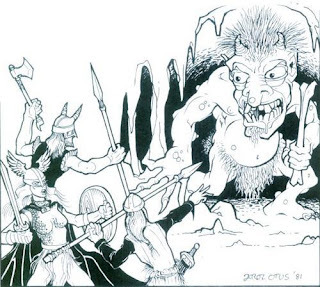 But a perusal of its quirky pages also reveals a variety of monsters that have become "classics" in the annals of D&D. In addition it was the first hardcover to compile the various critters that had been published in modules up to it's release date. 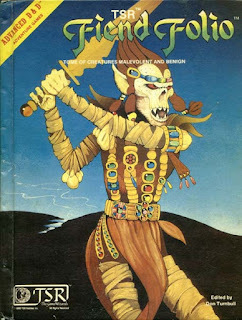 Besides Drow, and the daemons (Mezzodaemon and Nycadaemon), it detailed such remarkable baddies as the Githyanki and Grell (well used in one of my favorite modules the Forgotten Temple of Tharizdun!). This is what I imagined a small dragon encounter to be. A wizard crapping his robes and a fighter freaking the heck out. The dragon pissed that someone would dare to trespass in his lair. Piles of treasure waiting for the brave adventurer. I still love this drawing. 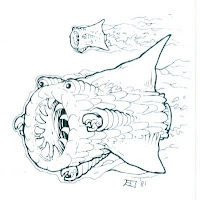 I can't tell who the artist is, the signature seems to say Ian Gorn, but no such illustrator is credited, or even any name remotely similar in the credits. 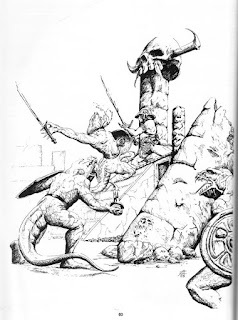 Of all the illustrations in the Fiend Folio, the one that most inspired me was this one of a fighter, who looks very much like John Carter of Mars, battling Lizard Kings. This illustration inspired me so much that I wanted to draw like that artist (whose signature is indecipherable). Looking at it now I can see all the anatomy and other technical problems, but it is a good composition and my nostalgia still lets me see it like my younger, less art-educated, self. This image is just cool! I love that Valkyrie-like character. The emotion of the tragic moment a mighty warrior has been felled resonates in this image. The drawing and inking are superb. I love this drawing. It still inspires me and makes me want to make cool art. The Fiend Folio is a real mixed bag. Mostly remembered for it's silliness, but it also had some of the best TSR had to offer in the way of cool and interesting monsters.